Shop with our retail friends in Phoenix, Prescott and Tucson. We are also represented at Airport locations in Phoenix, Denver and Albuquerque. Aaron Voigt is now featured in Terminal 4's Mosaic gallery at Phoenix Sky Harbor airport. Be sure to stop in and see Mr. Voigt's hand made Arizona robot banks. The 17th annual Recycle Santa Fe Art Festival will take place November 20-22, 2015 at the Santa Fe Community Convention Center (201 W. Marcy Street in Downtown Santa Fe). Join us for a weekend of unique art that not only looks great on your walls or around your wrist, but also keeps items out of our landfills! The Big Heap! A Vintage & Handmade Festival, a juried event featuring the best vintage furniture and decor, fashion, adornment, and handmade items in the West. "We wanted to take a minute to highlight our dear friend and artist Aaron Voigt. We met Aaron right before our very first Big Heap and fell in love. He emanates kindness, and urban, industrial, vintage coolness, and his work, well, you instantly want to put your arm around it, and become its friend. Forever. Currently, Aaron is the featured artist at Sky Harbor Airport in Phoenix and creating new works to share with the good people of Tucson in April, at The Big Heap. Be sure to stop in and say hi, and take home one of his signature robots." Art Auction benefiting Free Arts of Arizona Healing abused and homeless children through the power of artistic expression. 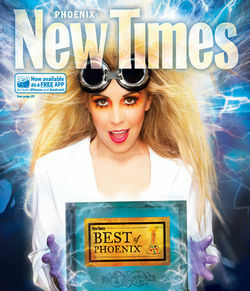 Voigt Metal-Best Of Phx 2012! Voigt Metal in The Phoenix New times Jackolope Ranch Blog.